As Hurricane Harvey reminds us, our environment can change in shocking and devastating ways. Floods and mudslides—generally the result of heavy rain and snow—are very unpredictable, but far from the only natural disasters that put our pets at great risk. What natural disasters may strike me and my pet? Earthquakes— Earthquakes, which are not weather related, could strike during any season—while other natural disasters are more seasonal. Tornados— In the U.S. tornado season tends to move northward from late winter to mid-summer. According to mnn.com, “In Southern states, tornado season is typically from March to May. In the Southern Plains, it lasts from May to early June. On the Gulf Coast, tornadoes occur most often during the spring. And in the Northern Plains, Northern states, and upper Midwest, peak season is in June or July.” The two regions with a disproportionately higher incidence of tornadoes are Florida and Tornado Alley. Florida’s high tornado frequency is credited to their almost daily thunderstorms, as well as the many tropical storms and hurricanes that affect the Florida peninsula. Forest and grass fires— Fires may threaten pets anytime the air is dry. All of these natural events can be locally and personally devastating. Fortunately, proper preparation can minimize the loss of property and life—both human and animal. 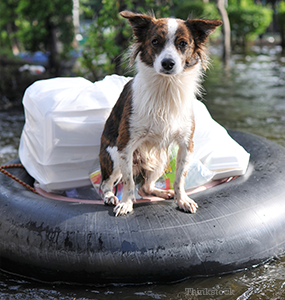 How can I keep my pet safe during a natural disaster? While some disasters, such as hurricanes, may give you a little time to prepare, most give no warning, and unless preparations have been made the loss of human and animal life and separation from family members may dwarf the physical destruction. So just how do you, as a pet owner, make preparations for a disaster? Microchipping your pet will help you reunite. One of the most heart-wrenching results of a disaster is the separation and loss of a pet. In a time of fear even the most loyal and obedient pets may instinctively run away from the terror, and you could be forced to evacuate and leave them behind. They might be rescued by someone or wind up in a shelter but possibly miles away from home. Following a major disaster it is common for animal welfare agencies to be overwhelmed by homeless pets with inadequate or absent identification—making it nearly impossible to reunite them with their owners. Make sure your pet is wearing a collar and identification tag so they can be rapidly identified and reunited with you. Even better, make sure that every pet is identified using a permanent microchip implant. Unlike a collar and tag, these implants cannot be lost and are easy for a clinic or shelter to find. Make sure that cats and small dogs have a carrier or cage that will hold them comfortably. Make sure larger dogs have a leash and perhaps their own cage. There is a distinct possibility that your pet and you will have to be evacuated to a shelter or kennel and this will be greatly facilitated by a carrier/cage. In an emergency your pet will need fresh food and water. It may be that your local water supply will be disrupted and also that your local market will be closed or simply out of food. Be prepared with a few sealed gallons of water and a sealed container of food. Make sure your pet’s vaccinations are current; remember their exposure risk may be much greater after a disaster. Many pets have medication needs as well. Always have a 5 day supply of medications ready. A disaster can cause great anxiety for our pets. Have a blanket or favorite toy handy to help your pet feel more comfortable. Take steps now to protect your family pets. We never know when a crisis will occur, but we can prepare for the possibility.